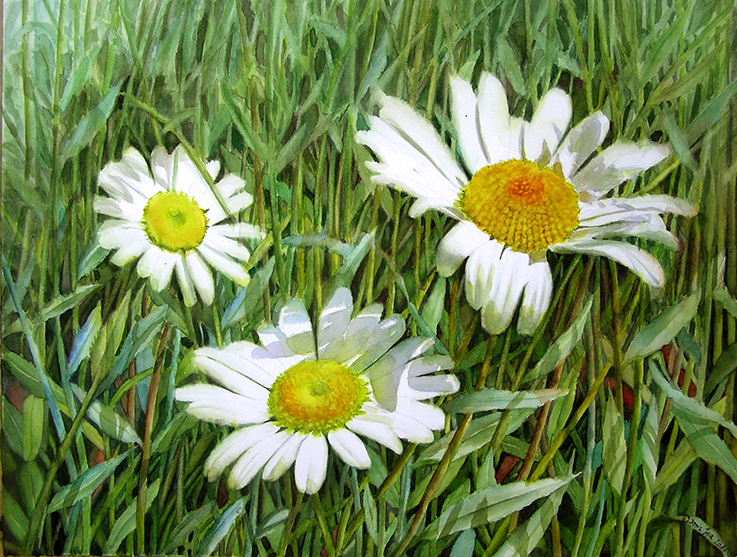 A few weeks ago I started a realistic watercolor painting of WHITE DAISIES. I will upload all the steps of this painting in the next days again but I just wanted to share the finished painting. It is different to my other work as I painted a lot of details in the background. Many stems and leaves. I enjoyed painting this background. Although it looks mostly like a green background it is not only the colour green what I used there. My main green was here the Sap Green and I mixed it with other colours, like some yellow, some blue and some reds. I also made a short video about the inner of one daisy but it needs some time until it is available. I love especially the dancing shadows on the white daisies. You will notice that the shadows are not only blue or violet – I mixed my colours there. I used also here some red, some blue, some yellow, some green. ← How to paint the colour pink?